So like many of you, I was faced with what to prepare for last week’s Super Bowl game. I had plenty to choose from, however I wanted to do something a bit different for the party that our cousins were hosting. For some odd reason my first reaction was thinking about all of the great bar food, and sure enough chicken wings and jalapeno poppers immediately came to mind, that and an adult version of pigs in a blanket, which I will share with you later in the week. I really did not feel like spending a lot of time stuffing jalapenos for the poppers, so I thought that by using all of the great stuff that goes into a popper, along with a few extra items, that this would sure be a great hit, and man, was it ever! This dip has all the comfort you need, along with just a bit of heat, and is a perfect appetizer for any game day, or party you put together. Lets get started. Preheat your oven to 375 degrees. Add all but the panko, butter, and half a cup of parmesan to a mixing bowl. Mix well to incorporate all of the cheese and peppers into the cream cheese. 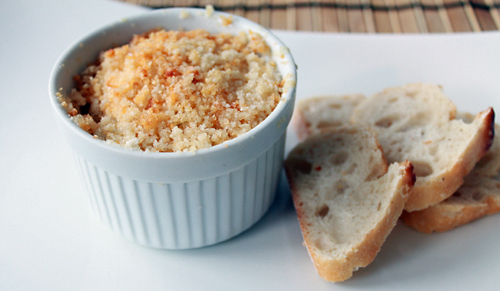 Lightly grease small ramekins, or a small casserole dish and place the cheese mixture into it. In another bowl add your breadcrumbs, parmesan cheese, and melted butter. Mix well, and place on top of the cheese mixture, making an even coating. Place in the oven for about 30 minutes until the breadcrumbs are nice and golden brown and the cheese is nice and hot. Serve with the slices of French baguette, pretzel rods, or tortilla chips. Trust me on this one, it was a real hit, and had all of the flavors of a great jalapeno popper. I hope you enjoy it. Delicious looking! I will most likely roast and skin the peppers when I try this, because I like a mellower smoky pepper flavor. I read your blog all the time and love it! Thanks for the inspiration. This was so good, it’ll be hard to go back to any other spread or dip. 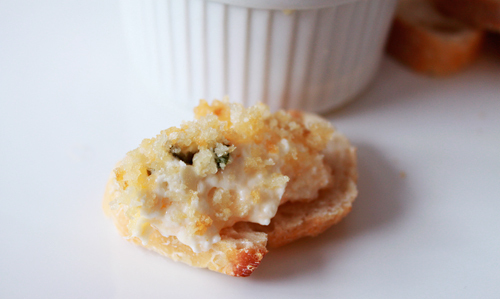 It is so creamy and yummy, you can’t go wrong with this appetizer for any occasion!